In 1954 in New York City, two displaced persons from Lithuania, Jonas and Adolfas Mekas, founded Film Culture, a magazine that would come to shape the discourse about the intersections among cinema, society and the arts in the United States and beyond. From 1955 to 1996, there were seventy-nine issues of Film Culture, a periodical and a unique platform for exchanges between filmmakers and audiences, theory and practice, cinema and art. Film Culture featured an eclectic mix of interviews, historical articles, manifestoes, film analyses, artist's writings, poetry, photographic essays and documentary reports on the establishment of independent structures for film production, distribution, and exhibition. Over twenty years since the magazine ceased publication, silent green Film Feld Forschung returns to its history and example. The festival programme, the exhibition and a film series will ask what it means to edit film culture today. During the three day festival filmmakers, artists, curators and scholars from all over the world will discuss past and present meanings of the term "film culture". In an opening night concert, Gina D'Orio and Susanne Sachsse with Robin Behling and Anton Garber will edit selected texts from Film Culture magazine in a mad, moody music performance. On July 7, there will also be a rare concert featuring a solo set by Thurston Moore (Sonic Youth), followed by Jonas Mekas himself on stage with his band of avant-garde musicians from the United States and Europe, presented by Lithuanian Culture Institute. Edit Film Culture! 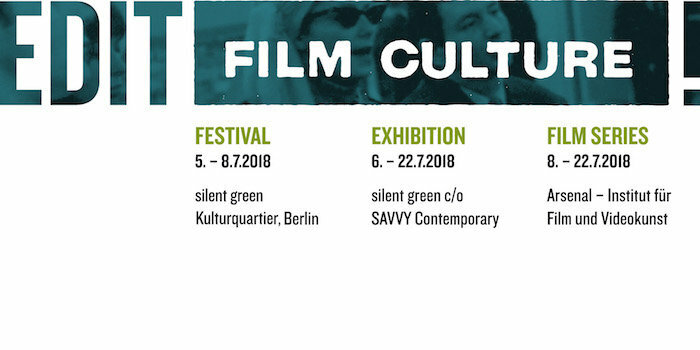 is a project by silent green Film Feld Forschung gGmbH in collaboration with Jonas Mekas / Anthology Film Archives, Arsenal – Institut für Film und Videokunst e.V., SAVVY Contemporary e.V., Harun Farocki Institut, Spector Books and Lithuanian Culture Institute. Curatorial Team: Christian Hiller, Daniela Kinateder, Stefanie Schulte Strathaus, Marc Siegel, Bettina Ellerkamp and Jörg Heitmann. With kind support by ifa – Institut für Auslandsbeziehungen and Jonas Mekas Visual Arts Centre, Vilnius.